Growing vegetables in your garden in Balham can be tricky, as there are a lot of factors to take into consideration. Tomatoes are one of the most popular choices of vegetable to grow in any garden, as they don’t require much attention when compared to other vegetables, and they produce a versatile and useful vegetable. If you’re thinking about growing tomatoes in your garden, then here are some tips to help you to discover how! 1) Planting your tomato seeds. It’s best to start your tomato plants off indoors, so make sure you have a large enough pot for your plants. Purchase some tomato seeds, and make sure you’re planting them around two months before the last frost of the season in Balham, SW12. Once your seeds are planted, keep your plants moist by watering them regularly. 2) Selecting an area of your garden. For the best results you’re going to want to plant your tomato plants in an area of your garden that sees a lot of sun. Tomato plants require a lot of warmth, so try testing out different sections of your garden to find the warmest area for planting. Once you know where you want to plant, it’s a good idea to have a sample of your soil tested. Tomato plants grow best in soil with a pH of 6.0 to 7.0, so make sure your soil is suitable before moving your tomato plants. You also need to make sure that you have a vine or trellis in place for your tomato plants to grow on. 3) Moving your tomato plants. 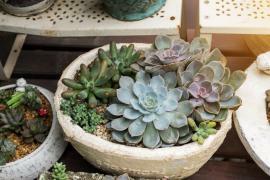 Your plants are ready to move outside once they’ve started to grow too big for their pot. Move them outside and dig a hole large enough for a football for each plant that you have. Try adding a spade-full of soil and grounded eggshells to each hole – the eggshells will add calcium to your plants to ensure proper growth. 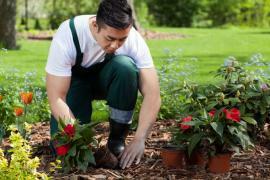 Your plants should be spaced around 18 inches apart for the best results. Place each plant into its designated hole, ensuring that they’re in quite deep, as this will encourage the roots to grow. 5) Keeping your plants safe. Protect your tomato plants from cold weather and pests by investing in some floating row covers. These are a great way to keep your plants intact for as long as possible, so have a look in your local gardening centre in the SW11 region to find some. Your plants should see around two inches of water every week, so make sure they get this if you want ripe and healthy tomatoes. 6) Hiring a gardening company. If you aren’t sure about growing your own tomatoes – or any plants or vegetables – in your garden then you can always hiring a planting service from your local gardening company in Balham. Gardening professionals will make quick work of your planting needs, so you won’t need to worry about having green fingers. Your local gardening experts can help you with gardening services such as this, and more, so that you can get assistance with everything from trimming and hedging to lawn planting. Make sure you’re hiring reliable gardeners by asking your friends or family for recommendations of companies, or, if you’re hiring online, make sure to read lots of reviews from different sources so that you can be sure you’re hiring dependable gardening staff.